Perhaps the most significant factory test made on the insulation of full reels of extruded cable is the partial discharge test. This is usually done at power frequency, but can also be carried out at very low frequency and at some voltage significantly higher than normal working voltage to ground. Experience has shown that this test is a very sensitive method of detecting small imperfections in the insulation such as voids or skips in the insulation shield layer. 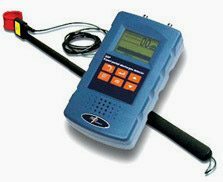 It would therefore seem logical to repeat tlus test on installed cables to detect any damage done during the shipping or laying or any problems created by jointing and terminating the cable. Unfortunately this is a difficult measurement to perform in the field due to the presence of partial discharge signals. However, in spite of the difficulty, this test has been performed in the field where some special circumstances suggest it is worth the time and expense involved. Typically this may be when damage or faulty installation is suspected or the cable route requires it to be of the highest possible reliability. Partial Discharge Detection System - It records partial discharge measurements for computer analysis using the optional XDP software for a PC. The XDP II is very accurate to detect partial discharge on cable joints,switchgear, elbows, cable terminations and more. Once the necessary steps are taken to reduce the noise level below the partial discharge level to be measured, the test can provide a great deal of useful diagnostic data. By observing the magnitude and phase of the partial discharge signals and how they vary with increasing and then decreasing test voltage, results will disclose information on the type and position of the defects and their probable effect on cable life. Partial discharges can also be detected at system voltage with special sensors connected to the splice or termination, using the frequency spectrum of the discharges. while performing high voltage DC test on power cables the negative polarity of source is connected to cable and postive is connected to ground ..why it is done so?? My question is. May a Hipot test be replaced by Partial Discharging Test? or Are them complementary? Actually, purpose of these two testing is different. Partial discharge testing is used as predictive maintenance tool to determine on-line condition of medium voltage equipment and cables. it is not destrutive, and HIPOT can be. HIPOT test is more suited to an acceptance test. DC hipot test can damage cable or equipment. PD diagnostic acceptance test is used the IEEE standards, while HIPOT is not. Answer to your question: I think PD test does not eliminate need for HIPOT test, and yes, they are complementary in some applications, but not all.